The exterior of the Restaurant Le Cavour along the Rue Saint Louis in Old Quebec in Quebec City, Canada shows the beauty of stone buildings. At the corner of the Rue Saint Louis in Old Quebec, a historic stone building known as the Joseph Bouchette House, is home to an excellent restaurant, Restaurant Le Cavour. The exterior is decorated with red awnings and red window frames and during the Spring, the hanging baskets start to bloom. While walking along Rue Saint Louis in Old Quebec City, Canada, stop in at the Restaurant Le Cavour, a lovely family owned restaurant. The food is excellent with an aura that is warm and relaxing where patrons are attended to by the friendly staff. The menu consists of a continental cuisine of French and Italian with entertainment that changes regularly. 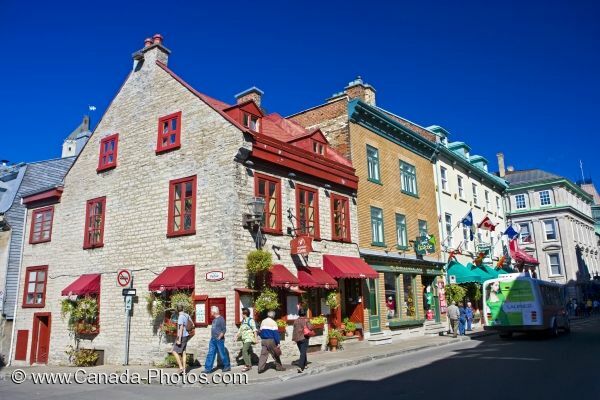 Photo of people along Rue Saint Louis in Old Quebec, Canada near the historic building home to the Restaurant Le Cavour.